My name is Russ Carter and I have been researching the Carter family since 2008. Within weeks of starting my research, I met our cousin Larry Carter, who had been researching the family for many years before that. Like Larry, and every other person researching the family that I’ve met, we all were stuck at William Carter and Rachel Brenneman. 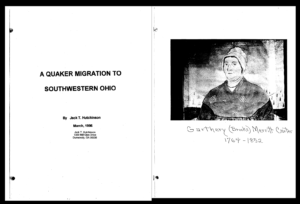 Everyone remained stuck there until 2010, when a booklet written by Jack Hutchinson called A Quaker Migration to Southwestern Ohio was discovered. This booklet had a history of Joseph Carter and Mary Gaskill that indicated that a William Carter that married a Rachel was the descendant of James Carter and Sarah Freel. 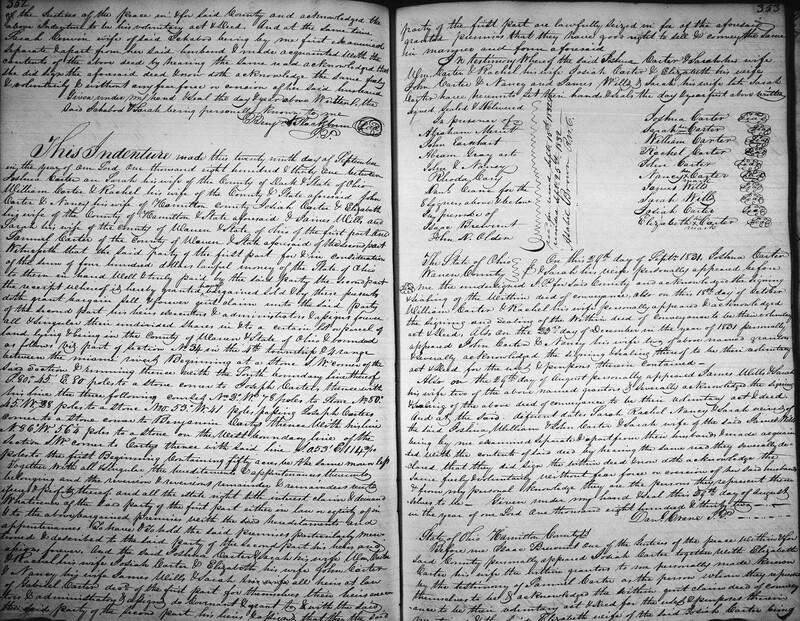 Unfortunately, it was not long before the marriage record of James and Sarah Freel was found, and because their marriage was in 1806 in Warren County, Ohio and our William was born in 1796 in New Jersey, we knew this information to be incorrect. Even more unfortunate, the information was added to some trees on Ancestry.com, and from there it has been copied repeatedly by others. I continued to study the Joseph Carter and Mary Gaskill family, but from the records available at the time, no connection to our William Carter could be found and the trail went cold again. Carter Y-DNA Haplogroup. Larry Carter’s test is at the bottom. His closest match is just above. Our common ancestors with our Virginia Cousins lived in the early to mid 14th century. Then Larry Carter decided to take a Y-DNA test on FamilyTreeDNA. The results of this test showed that a descendant of a Benjamin Carter, who was a Quaker from Burlington County, NJ was his closest match. After the owner of the other Y-DNA test was contacted, we tried, unsuccessfully, to find any possible connection for William to their tree. No further progress was made on research into the family until October of 2016, when I took the Ancestry.com DNA test and found I not only had matches to some of my 3rd cousins that had already taken the test, but I also had matches to descendants of a few descendants of Joseph Carter and Mary Gaskill’s daughter, Sarah who had married Joseph Kirby and to some of the descendants of Benjamin Carter from Larry’s Y-DNA test match. Then my 4th cousin, Marla Carter, a descendant of William and Rachel’s son William Carter also took the Ancestry DNA test. After looking at her test, we discovered more connections to those same families. At that point, I decided it was time to study the family of Joseph Carter and Mary Gaskill again. They had three sons, Joshua, Joseph and James. 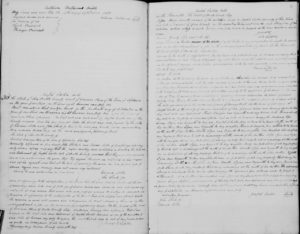 In my previous research, I had uncovered a probate record for their son Joshua Carter, who had died without a will, and the will of James Carter that named his children. I had found no probate or will for Joseph Carter Jr., so I decided that was a good place to start. According to A Quaker Migration to Southwestern Ohio, Joseph Carter Jr (III). 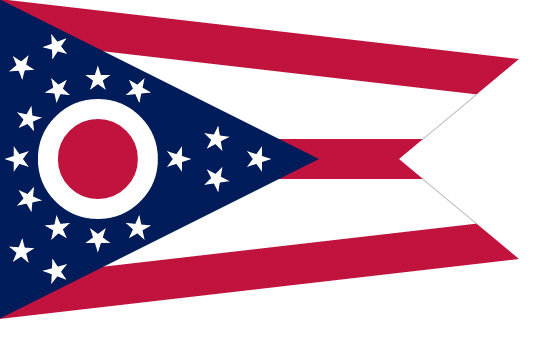 died in 1831 in Warren County, Ohio; however, after examining the Warren County tax and land records in Warren, it became apparent that Joseph Jr. had sold his property in Warren County and moved elsewhere. 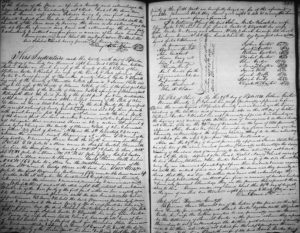 Fortunately, will and probate records for most Ohio counties are available online from Familysearch.org. 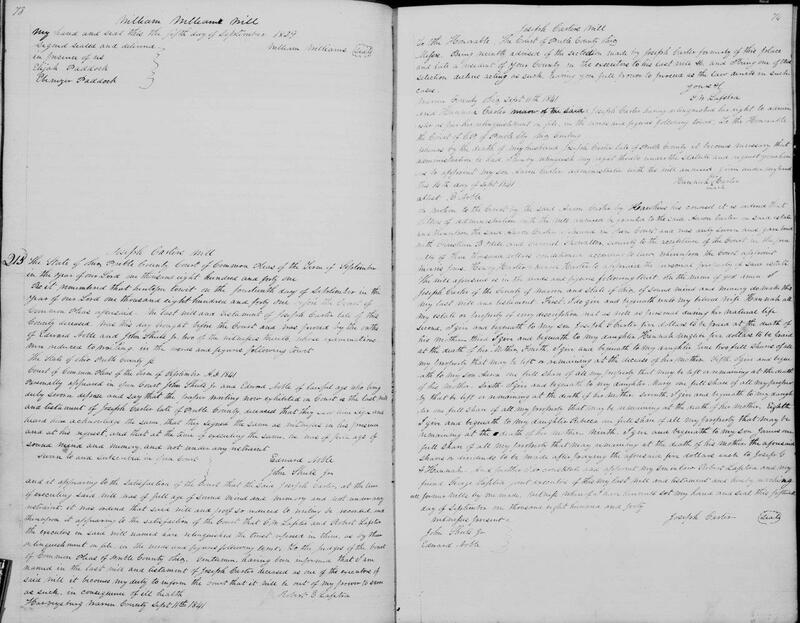 Unfortunately, these records are not indexed, so it took me a considerable amount of time to finally locate Joseph Carter III.’s last will and testament. Much to my disappointment, his will, which named his children, did not mention a son named William. While this was a disappointment, it also meant that if our William Carter was the grandson of Joseph Carter and Mary Gaskill, then Joshua Carter had to be his father. In the meantime, Jill Carter, the daughter of the descendant of Benjamin Carter, who was the match to Larry’s Y-DNA test joined the DNA project. Like our test, she had matches to her closer cousins, but she also has matches to the Joseph Carter Mary Gaskill family. When my 1st cousin Denia Woodland and Larry also took the Ancestry.com test and joined in the project, the results from their tests also showed connections to more cousins, both close and distant. From these 5 tests, there were enough connections to Joseph Carter and Mary Gaskill, that I was 90% confident that Joshua Carter was the father of our William Carter. Unfortunately, 90% isn’t 100%, and this isn’t government work, so to convince our most stubborn doubting-Thomas’, I knew I would need to find an actual record, proving that William was Joshua Carter’s son. 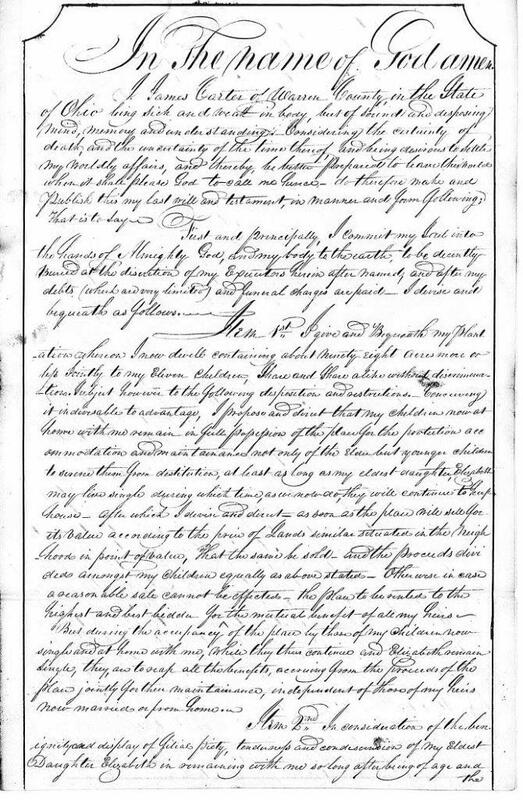 I had doubts whether such a record existed, but after stumbling into the record of the sale of Joseph Carter Jr.’s property in 1847 following the death of his wife Hannah, which contained the names of all of their living heirs, I had hope that such a record could be found for Joshua Carter. It took me a couple of days to come to that realization (sometimes I’m a little slow now that I’m getting older), but after I “woke-up”, I went in search of the record, which was quickly located on Familysearch.org. This is the final proof of our connection to the family of Joseph Carter and Mary Gaskill. Joseph Carter and Mary Gaskill were 1st cousins. Her father, Jonathan Gaskill and Joseph Carter’s mother, Mary M Gaskill were brother and sister and were the children of Josiah Gaskill and Rebecca Lippincott. Joseph Carter’s father was also named Joseph Carter. Joseph Carter, I, my 6th great-grandfather, is as far as we have been able to trace, but because of Larry’s Y-DNA test, there is about a 75% chance that Joseph Carter I and Benjamin Carter were brothers. Research is continuing looking at possible connections between the two families, and to find their origins; however, there are also closer questions that beg for answers. Like, who was Joshua Carter’s wife? All we know is that she was born in NJ and died in Warren County after the birth of her son Fenton Carter. What became of Joseph and Mary’s daughter Mary Carter and James Stephenson’s family or the other descendants of Joseph III and his brother James? Nothing is known about Joshua’s sons Joshua Jr. and John Carter. What happened to their families? The purpose of this website is to provide a space for our Carter cousins to learn about our shared family history and to promote further research into the family’s past. It is also a place for Carter cousins to share photos and stories from their branch of our Carter family. The goal is to provide a documented Carter family tree that is backed up by DNA evidence and to produce a narrative of the family’s history. The ultimate goal is to find our Carter immigrant ancestor. 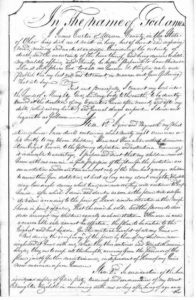 Many of our cousins are probably stuck (or have gone astray) at a Carter ancestor who was born between 1790 and 1840 in PA or OH, with no idea where to look next. This was the case for the descendants of my 3rd great-uncle, Harrison Carter, and the descendants of my 4th great-uncle, Josiah Carter. While our Carter-Kirby cousins generally do not seem to have that problem, the descendants of Joseph, Mary, and James may have no idea that their Carter ancestor is related to our family. This is especially true if the family moved out of state or to another county before 1850. If their ancestor was a female, they may not know that she was a Carter. Because of our knowledge of the family tree and the ability of the DNA project to identify matches to our cousins that have hit a brick wall, we are in a unique position to break that brick wall for them and introduce them to 200 plus more years of family history. If you have a family tree on Ancestry.com, PLEASE update it with the latest information to help stop the spread of incorrect information. I think that Ancestry.com allows you to add people and update their vital statistics even if your subscription is not active. You will not be able to view or download any records, though you can ask to be invited to my tree for that. If you have taken the DNA test and have it attached to your tree, updating your tree with the correct information will also help Ancestry form DNA circles for our Carter family. If you have taken the Ancestry DNA test I’d also ask that you consider joining our DNA project. Read More About it Here.